From the Departments of Neurology (K.S., M.A.B., G.U.H.) and Psychiatry and Psychotherapy (M.A.B), Technical University of Munich; Department of Nuclear Medicine (J.H., T.v.E. ), University Hospital of Cologne; Department of Neurology and the German Center for Vertigo and Balance Disorders (DSGZ) (A.Z. ), Ludwig-Maximilian University of Munich; Department of Neurology (C.B. ), University Medical Center Hamburg-Eppendorf, Hamburg; German Center for Neurodegenerative Diseases (DZNE) (T.v.E. ), Bonn/Cologne; and DZNE Munich (K.S., G.U.H. ), Germany. Ocular motor apraxia (OA) is an inability to initiate voluntary saccades in a head-fixed position, while saccades can be initiated by the vestibulo-ocular reflex (indicating dysfunction in the frontal eye fields). Supranuclear gaze palsy (SGP) is a decrease in velocity and range of voluntary saccades and pursuit eye movements, which is overcome via the vestibulo-ocular reflex (indicating dysfunction of mesencephalic gaze control centers). Ultimately, both OA and SPG lead to an inability to execute voluntary saccades. Loss of voluntary saccade control with preservation of the vestibulo-ocular reflex is common to OA and SGP, thus requiring further differentiation. OA differs from SGP by the retained ability to initiate conjugated eye movements by ipsiversive active head turns. We report a case exemplifying the clinical differentiation between OA and SGP and discuss their relevance for topical diagnosis in neurology. A right-handed 49-year-old man was referred to us for diagnostic evaluation with suspected progressive supranuclear palsy (PSP) with predominant parkinsonism1,2 when he developed impairments of vertical and horizontal eye movement control after a 2-year history of progressive slowing of the left limbs and jerky movements of the left hand. He had no family history of neuropsychiatric diseases. Eighteen months after symptom onset, cerebral MRI had suggested mild right-sided parietal cortical atrophy and normal midbrain size, [123I]-FP-CIT SPECT had revealed right-sided loss of presynaptic striatal dopamine transporter–positive nerve terminals, and [123I]-iodobenzamide SPECT had shown bilateral symmetric reduction of the postsynaptic striatal D2 receptor expressing neurons. A therapeutic trial with 800 mg of levodopa per day had not yielded symptomatic benefit. The ocular motor examination aimed to elicit voluntary conjugated horizontal (leftward) and vertical (upward) pursuit (A) and saccadic (B) eye movements, as well as reflexive eye movements triggered by passive head turns executed by the examiner (i.e., vestibulo-ocular reflex, C), and by active head movements initiated by the patient (D). This patient was unable to initiate voluntary saccadic or pursuit eye movements in all directions; passive head movements triggered a gaze shift in the contralateral direction showing integrity of the vestibulo-ocular reflex (compatible with a diagnosis of supranuclear gaze palsy [SGP] and ocular motor apraxia [OA]); active head movements initiated a gaze shift in the same direction (compatible with a diagnosis of OA, but not SGP). 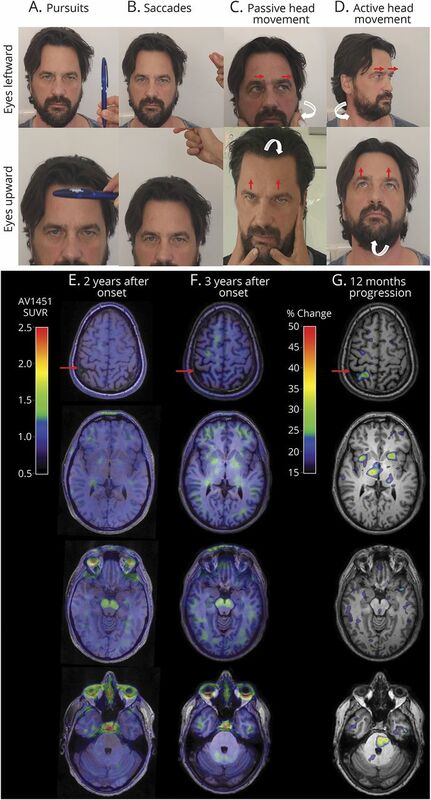 [18F]-AV-1451 PET superimposed on MRI was obtained 2 years (E) and 3 years (F) after onset of first symptoms (at 47 years of age), and the % change in the PET signal during the 12-month follow-up period (G). The MRI shows the progressive atrophy of the right sided parietal cortex (red arrow). The PET images reveal slightly increased uptake in the right frontal, insular, and parietal cortex. The PET signal increased significantly in the right-sided paracentral region (+40%), insular cortex (+35%), thalamus (+35%), and pallidum (+25%); in the left-sided caudate nucleus (+35%); and centrally in the pons (+35%) and midbrain (+20%). All blood laboratory tests were normal, including serum levels of vitamin B12 and parathyroid hormone. A paraneoplastic antibody panel was negative. Serum ceruloplasmin and urinary copper excretion were normal, ruling out Wilson disease. CSF analysis showed normal cell counts, protein levels, and glucose levels, ruling out inflammatory diseases. CSF levels of total tau (136 ng/L, normal <252 ng/L) and S181-phosphorylated tau (26 ng/L, normal <60 ng/L) were normal; β-amyloid (Aβ) 1-42 was slightly decreased (602 ng/L, normal >650 ng/L), but the Aβ 1-42/1-40 ratio was normal (0.081; normal >0.05), ruling out Alzheimer disease (AD). Structural MRI confirmed mild right-sided parietal cortical atrophy (figure, E). PET with the tau-binding tracer [18F]-AV-1451 reported increased signals in AD and non-AD-tauopathies,8 and revealed slightly elevated uptake in the right-sided frontal, insular, and parietal cortex of our patient (figure, E). At a follow-up visit 12 months later, the patient reported progression of his symptoms, but was still highly functional in daily life. Neuropsychological testing was still normal. The physical examination now revealed moderate severity of bradykinesia, rigidity, and stimulus-sensitive myoclonus in the left limbs, and a spread of these symptoms in mild severity towards the right limbs. The OA was now noticeable even during normal conversations. The CSF levels of the AD biomarkers had not changed significantly; total tau (147 ng/L, normal <252 ng/L) and S181-phosphorylated tau (26 ng/L, normal <60 ng/L) were still normal, the level of Aβ 1-42 was slightly more decreased (482 ng/L, normal >650 ng/L), and the Aβ 1-42/1-40 ratio was still in the normal range (0.082; normal >0.05). Follow-up MRI showed marked progression of the right-sided parietal atrophy and mild right-sided frontal atrophy (figure, F). The follow-up [18F]-AV-1451 PET revealed a similar overall pattern (figure, F), with a substantial increase in signal intensity vs the baseline scan (figure, G) in the right paracentral region (+40%), insular cortex (+35%), thalamus (+35%), and pallidum (+25%); in the left caudate nucleus (+35%); and centrally in pons (+35%) and midbrain (+20%). The combination of the basal ganglionic signs (rigidity, akinesia, and myoclonus) with the cortical sign (OA) in absence of postural instability and cognitive and behavioral deficits was best classified as CBS.2,10 The asymmetric parietal cortical atrophy without mesencephalic atrophy on MRI, along with the presynaptic and postsynaptic nigrostriatal dopaminergic degeneration on SPECT, provided structural support to this diagnostic classification. For clinical practice, OA can be differentiated at bedside from SGP by testing the patient's ability to initiate conjugated eye movements by voluntary ipsiversive active head turns (present only in OA) as opposed to vestibular reflexive eye movements contraversive to passive head turns (present in both OA and SGP). Kerstin Schweyer: study concept and design, acquisition of data, analysis and interpretation of data, drafting the manuscript. Marc Aurel Busche: study concept and design, acquisition of data, analysis and interpretation of data, critical revision of the manuscript for intellectual content. Jochen Hammes: acquisition of data, analysis and interpretation of data, critical revision of the manuscript for intellectual content. Andreas Zwergal: analysis and interpretation of data, critical revision of the manuscript for intellectual content. Carsten Buhmann: acquisition of data, analysis and interpretation of data, critical revision of the manuscript for intellectual content. Thilo van Eimeren: acquisition of data, analysis and interpretation of data, critical revision of the manuscript for intellectual content. Günter U. Höglinger: study concept and design, acquisition of data, analysis and interpretation of data, study supervision, drafting the manuscript for intellectual content. Günter U. Höglinger was funded by the Deutsche Forschungsgemeinschaft (DFG, HO2402/6-2).
. Advances in progressive supranuclear palsy: new diagnostic criteria, biomarkers, and therapeutic approaches. Lancet Neurol 2017;16:552–563. ; Movement Disorder Society-endorsed PSP Study Group. Clinical diagnosis of progressive supranuclear palsy: the movement disorder society criteria. Mov Disord 2017;32:853–864.
. A type of paralysis of conjugate gaze (ocular motor apraxia). AMA Arch Ophthalmol 1953;50:434–442.
. Apraxia in movement disorders. Brain 2005;128:1480–1497.
. Central ocular motor disorders, including gaze palsy and nystagmus. J Neurol 2014;261(2 suppl):S542–S558.
. The MAPT p.A152T variant is a risk factor associated with tauopathies with atypical clinical and neuropathological features. Neurobiol Aging 2012;33:2231.e7–2231.e14.
. Neurodegenerative disease phenotypes in carriers of MAPT p.A152T, a risk factor for frontotemporal dementia spectrum disorders and Alzheimer disease. Alzheimer Dis Assoc Disord 2013;27:302–309.
. In vivo retention of 18F-AV-1451 in corticobasal syndrome. Neurology 2017;89:845–853.
. Cortical control of reflexive visually guided saccades in man. Brain 1991;114:1473–1485.